A wisp of a shrub that is very hard to photograph but makes a great hazy gray light texture in the garden. 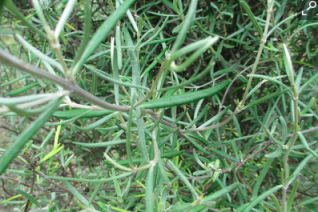 Large see through evergreen shrub with thin gray leaves that are only 1/3″ wide but 2″ long. One of the famed daisy bushes from New Zealand, it is also one of the cold hardiest for us. Fast growing willowy appearance to 8′ x 4′ in 5 years. Full sun and average to poor well drained soil. Incredibly drought tolerant when established. Tiny white daisies appear along the stems below the leaves. Easy to grow. And if it gets too out of control simply cut it back hard in mid-spring- recovery and more dense growth will quickly follow. Plant with ornamental grasses and Arctostaphylos for a scintillating dry landscape look. 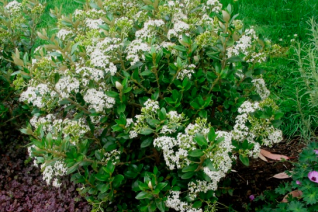 Our most favorite New Zealand Daisy Bush this Olearia hybrid forms a large ever-gray rounded shrub. The small waxy thick leaves have a top of olive green and an underside of nearly white. Clusters of white daisy flowers in summer have a distinct vanilla fragrance that carries for some distance. And following those are fluffy tan seed heads. A tough and cold hardy Olearia – we’ve never seen it damaged by cold in PDX. To 6’x 7′ in 5 years for full sun and poor to average well drained soil. Completely summer drought tolerant- once established no water is required. Handsome shrub for wild areas, an informal hedge, coastal spray. In time the trunk becomes shreddy and gnarled. Prune after flowering if needed. Moderate deer resistance. Handsome plant.